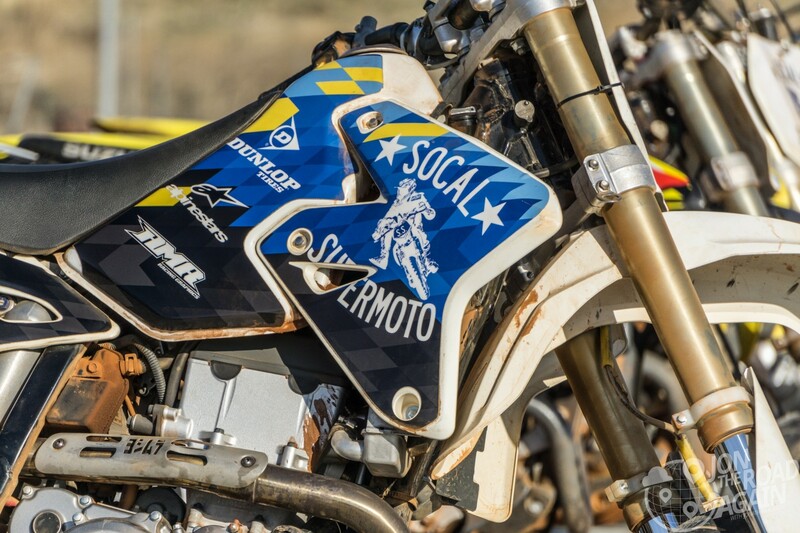 Socal Supermoto is a one-day introduction to the world of supermoto motorcycling. The day shows street and dirt riders the fun that can be had when you combine dirt and street into one track. With a friend of mine singing its praises for more than a year now, I am finally able to join him and a few other Seattle-based riders for a trip to Riverside, CA. 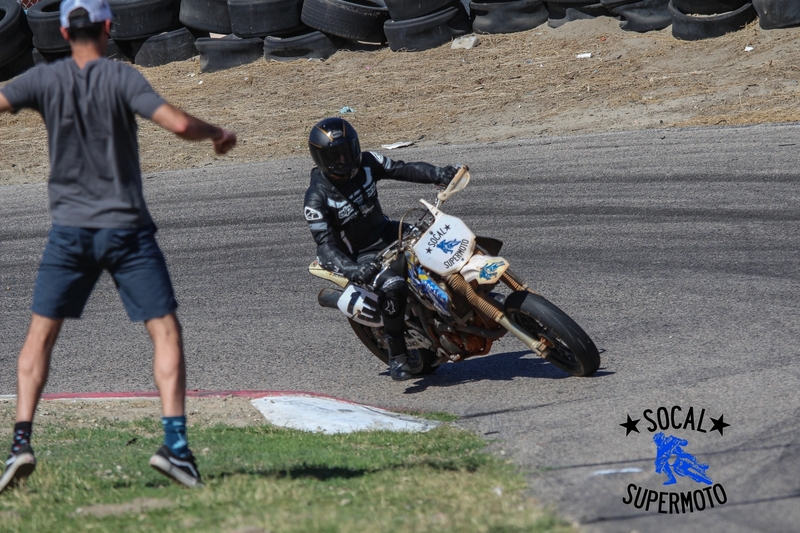 For $279 (or less, sometimes) you get professional, personal supermoto training, a bike provided, a full day on the track, lunch, pro photos, and a souvenir shirt or hat. Class sizes are pretty small, maxing out around 16 riders. It’s a screaming deal. The day begins at 9am. 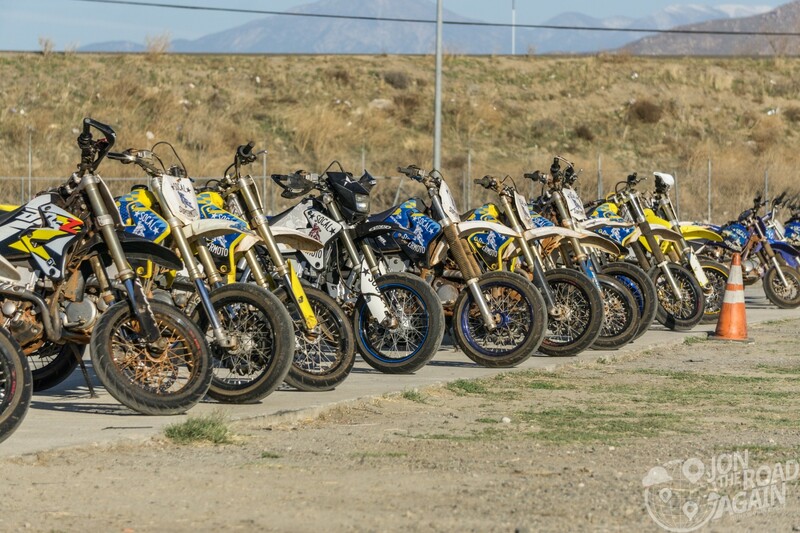 While you get an orientation, the Socal Supermoto team is lining up the bikes to get ready for the day. 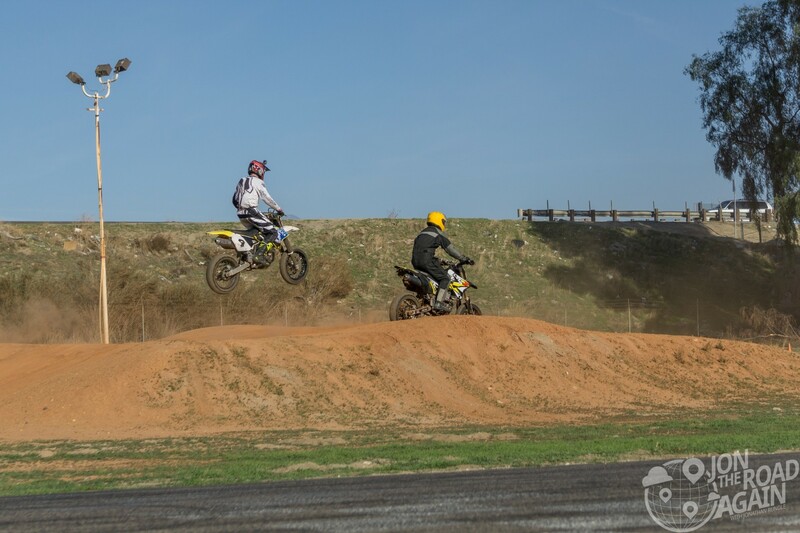 The bikes are Suzuki DRZ400sm’s – one of the most popular options for supermoto. These bikes have clearly had a lot of experience, but they are by no means “clapped out” – and the owners are (rightly) quick to defend them. If you want new plastics on every bike, prepare to shell out $600 for a track day instead of the $279 Socal Supermoto charges. Our first look at the track. 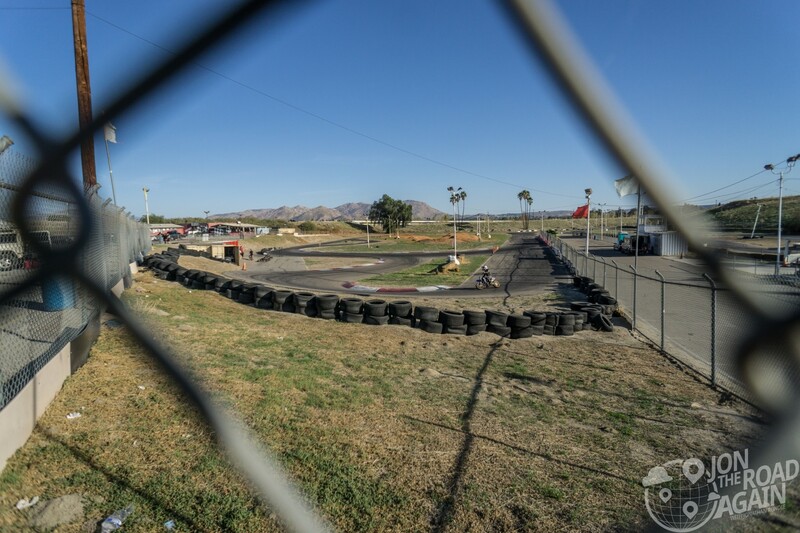 Adams Motorsports Park features one long straight, two shorter straights and lots of turns. At the center of the photo, you can see the short dirt section with two little whoops, a banked turn and a double before getting back to pavement. I ride a streetbike pretty well, but this was brand new to me. A few people in our group actually dropped out because they were uncomfortable on the bikes. You hate to see that, but if you’re that scared it’s probably for the best. For your money you’re getting a number of 15 minute sessions (I don’t remember how many, but it was plenty), the student race, and a final “free ride” time afterward. Classes are taught between sessions on how to enter and exit the curves of the track, how to position your body, what to concentrate on for the next session (called “homework), with one persistent bullet on the whiteboard for each and every session: “Don’t crash.” We must be good listeners, as no one crashed. 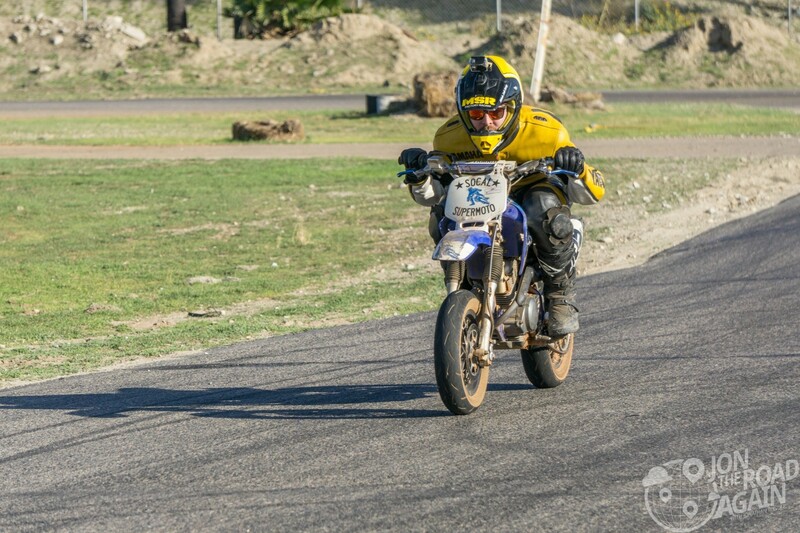 What I lack in supermoto skill, I make up for in poses. Check me out; kicking my leg out like the big boys. I’ve done a track day before – at a full sized race track. There, the speeds are much higher; making your mistakes that much more costly if you make them (or if some other noob smashed into you, like what happened to me). Plus, you’re usually out there on your own bike. Here you get to rip around on their bike, on a smaller course. The speeds are slower but the race education is the same (or even better). Whether you’re going 100 mph or 30 into a turn, the same principles apply. The owner/instructor Brian was out there in the corners giving personalized instruction. My problem (probably one of many) was my body positioning. I couldn’t remember to stay up on the tank – I would just settle into my normal relaxed position instead of staying on top of the handlebars. Hey, something to keep in mind for the next visit! This dude was example A of how to get it done. 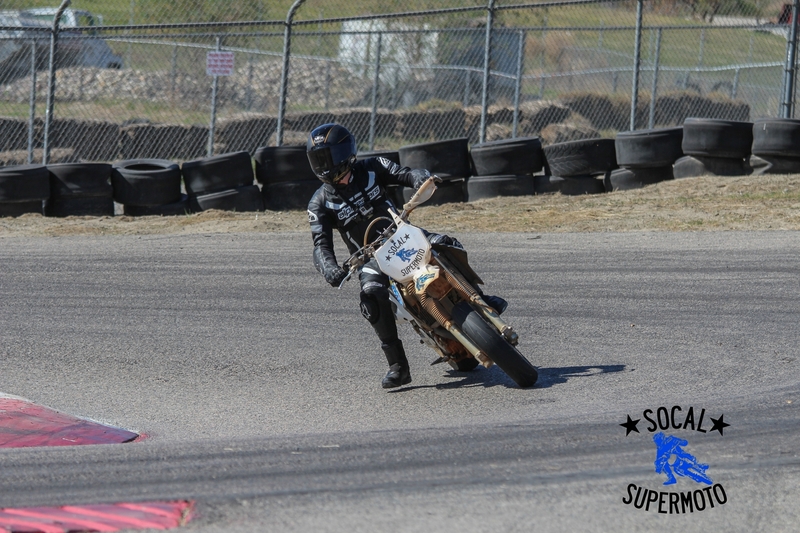 The winner of our student race, he tore up this track like it was his backyard. It was pretty thrilling to watch him blast by and sail over the dirt jumps. After lunch, the dirt section opens. As mentioned previously, the rider in the white jersey had no reservations about riding track tires in the dirt. Most of the rest of us rode as if the dirt was going to swallow us whole. I have to admit, the dirt intimidated me. I’ve only done some forest roads on the Tiger 1050 and wasn’t sure if I would dump it immediately. After the first time through, though, I couldn’t get enough. It was crazy fun to get even the little bit of air I eventually got. Maybe next time I can sail over the jumps like the star student below. The final session of the day is the student race. The race begins with a LeMans-style start (meaning you start off the bike across the track and have to run to your bike and start it). This is silly good fun. Take a look at the video below to watch that LeMans start and a few other excerpts from the day’s riding. Even with the necessary-for-me roundtrip airfare from Seattle, the day was money well spent. 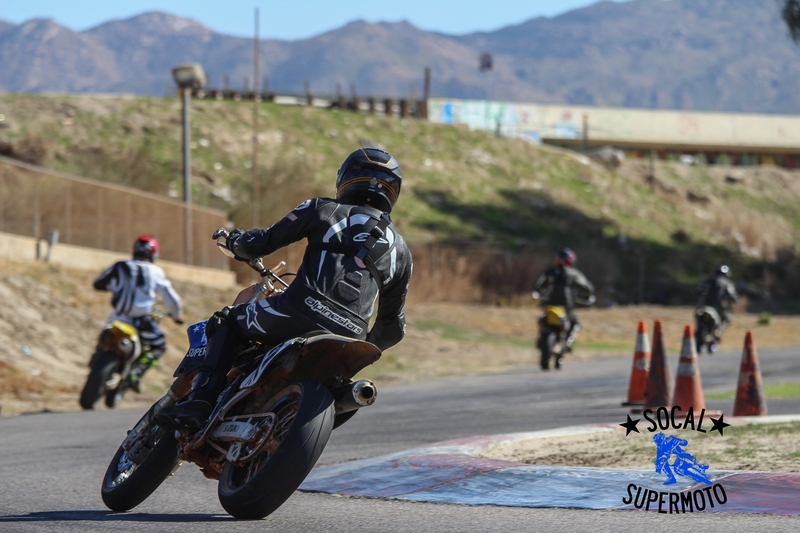 Socal Supermoto has been reviewed lots of places. Even Keanu Reeves has taken his turn around the go-kart track. All of those reviews can be summarized in two words: DO IT! And I completely concur. 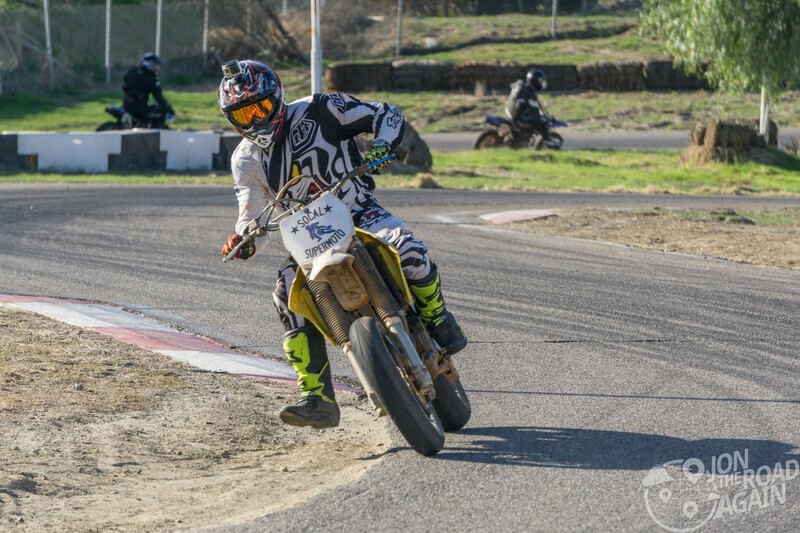 Book a session with Socal Supermoto. I’m glad you went.You are your father’s son.